Clever twist at the end, Diane, though not so fortunate for poor wee starving sparrows. I'm sure they have ways of protecting themselves, but I still fear for them each winter. 'Comes the starving time'. So poignant, Diane, and what a wonderful match of poem to image. Thanks, Sally, I try to make my poems fit. I hate reading a poem about cherry blossoms, for example, and the accompanying picture is clearly a rhododendron or some other flowering tree. I think we forget that in winter animals have a starving time. I admire how they manage to get through it. Perhaps your sparrow has a storage of seeds to munch. My LOC challenge is on my blog. Thanks for the little push. Always happy to provide a little creative nudge! Your poem on the blog is masterful! I always feel bad when we hire people to toss sparrows out of our eaves. But they drive me mad, rustling and arguing from the wee hours on. Now I feel sad for them, picturing them starving. I missed PF & your challenge, Diane. It is a harsh time in winter for birds & other forest animals. I like that you brought it so close to home with those 'crumb-bearing boys'. 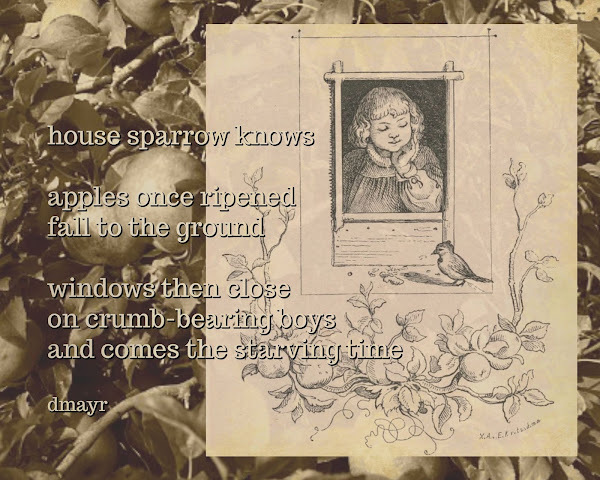 Next Friday I'm posting animal poems inspired by Library of Congress images. It doesn't have to be a bird poem. Email me your poem and a link to the LoC image by next Tuesday. 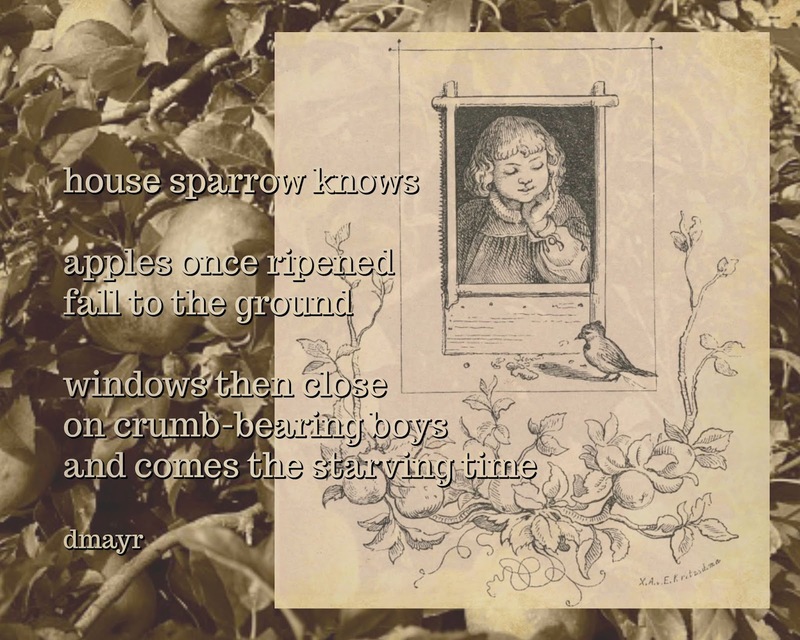 love the format of the "sparrow knows" - such a hardy little bird! The format is a cherita. Three stanzas of one, two, three lines. It's currently my preferred form. Sad, but oh so vivid and poignant. I wonder if the birds will be the first casualties of climate change, too? Sad, indeed. Those poor sparrows--maybe someone will stock a bird feeder or two for the winter. I have been inspired by your cheritas. Windows closing on crumb-bearing boys...such a sombre point to ponder. Thanks, Diane! Diane, your cherita is such a great story but sad as winter comes. I totally forgot to create my LOC poetry offering so maybe I can have it in by tonight. Thanks for offering the challenge. I agree with Sally, the image and poem work very well together in your melancholic yet beautiful poem, thanks.